As part of our initiative to make City streets safer throughout the neighborhoods, the Lake Worth CRA partnered with the Lake Worth Rotary Club to install new BriteSide® Reflective Panels to stops signs at various intersections. In 2015, CRA Staff and volunteers from the Rotary Club installed 100 red reflective panels at intersections primarily located within the Tropical Ridge and Royal Poinciana Neighborhoods. BriteSide® Reflective Panels dramatically increase the visibility of traffic signs day or night, and provide a cost efficient and highly effective traffic calming solution. They have been utilized as a critically important part of national road safety programs since 2000 and now, the Safer Roads Program is bringing the benefits of this product directly to Lake Worth. The reflective panels are a means to calm traffic and increase safety for drivers and pedestrians. 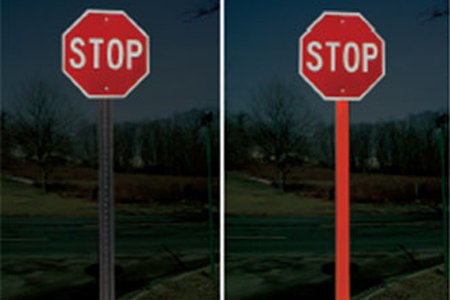 Many traffic fatalities are caused by motorists who fail to see critical safety signs such as stop signs. The CRA identified many of the most dangerous intersections within the community prior to installing the signs. The reflective signs were donated free of charge from BriteSide Panels. All other materials and labor were donated by CRA Staff and Rotary Club volunteers. For more information about the Rotary Club, please visit: www.rotary6930.org. Read about the newly installed BriteSide Reflective Panels in The Palm Beach Post.